Teachers are amazing. Their ability to juggle multiple levels and abilities of students while continuing to meet the needs of all students is nothing short of a miracle. Can you remember your own favorite teacher – the one that made you see for yourself that you had what it takes to succeed? I know for me, the best teachers saw my potential and led me to discover it myself. Those great teachers make education happen; they make the world better. I believe wholeheartedly that teachers are truly superheroes in the flesh. To teachers, therapists, teacher aids, Sunday school teachers, bus drivers – every person that loves my children, I want to share how grateful I am for the amazing work you do. I cannot imagine what my children’s educational life would be like without you. As a parent, I want you to know I am behind you 100 percent. I want to do whatever I can to help make your job easier. Having a student with hearing loss in your classroom might feel a tad intimidating. You might not have had a student in your class with hearing loss before. I want to help make you feel equipped and confident to educate my child with hearing loss. So, here are a few helpful tips that can come as reminders or new insights for all those amazing teachers that are working with young children with hearing loss. To make matters extra tricky, giving you tips about hearing loss can be helpful to give you a general idea of what life is like with hearing loss. However, every child is different. Their hearing loss is going to impact them in a unique way. A child with a cochlear implant will have specific challenges and strengths. A child who has had hearing aids from infancy will be different from another child that has only had them for a short time. Getting to know the specific child’s needs will be a great starting point to helping them learn. Because every child with hearing loss is different, connecting with parents, speech pathologist, hearing itinerants, and even nurses can be beneficial. Typically, these extra teachers will have followed your student from year-to-year. These teachers are the best resources to ask questions. For Ayden, his hearing teacher will follow him throughout his educational life. Before the beginning of the year, she will equip classroom teachers and aids working with Ayden. 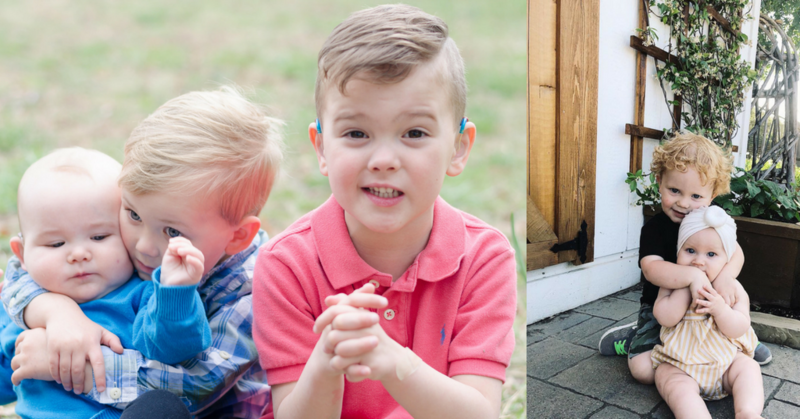 She gives training on how to use the FM system, tips for teaching, and give specifics on Ayden’s specific hearing loss and insights on how he is doing. The value of her role is beyond words. A hearing itinerant makes sure that clear hearing is happening. Whenever you have a question, a battery dies, your student isn’t responding as they use to, they are falling asleep in class, refusing to wear hearing aids, etc – check in with the hearing itinerant. While hearing loss a common birth defect in infants, it is still considered a “low incident” disability. (Friend, Bursuck*). Consequently, this means that even though you are an amazing, and experienced educator, you might not have had many interactions with students with hearing loss. Even as a parent, I do not see many children with hearing aids. Hearing aids and FM systems are amazing, however, they have two main barriers. The first is background noise. Hearing aids pick up all sound. That means the girl jabbering in the back of the room can sound just as loud as the teacher speaking in front of the class. The FM system helps this by making the teacher’s voice dominate over background noise. But knowing places that are going to make hearing harder are places like the park, a gym, and a noisy room. Another barrier is distance. When a student is far away from the teacher, it can be harder for them to hear clearly. Words can be mistaken easy and learning will be missed. For example, my son has a hard time hearing the “s” sound even with his hearing aids on. A word like “said” can sound like “aid.” Even missing one sound can dramatically impact the meaning of what a child with hearing loss is hearing. One of the most helpful things you can do as a teacher is to create a safe space to encourage self-advocacy. We want our children to feel comfortable advocating for themselves. This doesn’t come naturally, and they need time and practice to learn how to speak up for themselves. For example, letting you know when he can’t hear, asking you to repeat a statement, or letting you know when his batteries are dead are simple ways he is advocating for himself. For Ayden, a goal at 3-years-old was simply to teach him to say “what” when he missed what was said. Adding a few accommodations to your teaching style will be an incredible gift to students with hearing loss. Accommodations are different from a modification. 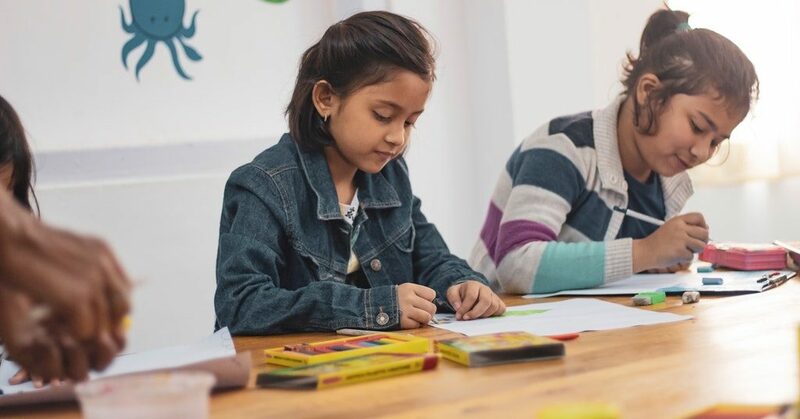 Dr. Buss an Associate Professor in the Special/Combined Education Program at Lewis University stated, “Accommodations do not change what is being taught, but how it is being taught.” A modification is different. To modify a curriculum is changing what is being taught. There is no reason that Ayden should not be learning all that his peers are. However, without accommodations, it will be easy for him to misses a word and dramatic impact on his understanding and learning. Position the student close to instruction. Get the student’s attention first before speaking. Check for understanding when possible. For example: Ask the student to repeat the directions that were given. Use visual cues, gestures, or signs when possible. My children respond so well to expressive communication. They do not know sign language fluently, but doing a few gestures can help clarify words for them. Let them see your face when you are talking. Repeat what other students have said. Use visual aids and pictures when possible. Be aware of concentration fatigue. Making these accommodations will allow a child with hearing loss to spend less time trying to figure out what you are saying and more time learning. Having time to share these tips with teachers is not always easy. I found myself racing through these tips and giving way too much information to be remembered. To help combat that problem, I sent Ayden to school this year with a few documents. Yes, it might have been over communicating, but that is okay with me. I would rather err on the side of repeating information then teachers not having enough information. What I sent Ayden to school with was a document sharing specifically about Ayden’s hearing loss, another one was about hearing loss in general. Lastly, I sent a simple “how to” use the Roger FM system. I found this most helpful for places outside the school, but where learning was happening. For example, any kind extracurricular activity, a babysitter, the library, and Sunday school at church. Teachers and educators of all kind, thank you for supporting my family and my child with hearing loss. You are making learning possible, and I am so grateful. *References: M. Friend. W. Burdock. 2015. Including Students with Special Needs: A Practical Guide For Classroom Teachers. Pearson. To other parents with children who are deaf and hard-of-hearing, what accommodations in a classroom do you find the most helpful for your child?